Parents are the ones who do all the sacrifices to raise a child. Seeing their child progress in life is the dream in every parent’s eyes. Hence, we should take a moment in thanking for all the hard labor they have gone through to make us successful in life. You can also see Thank You Letters . You will quit trying to control the outcome of your work. Rather, your focus will be optimistic towards above-people who care about you, your parents. Use this template to write a great thank you note. You may also see Simple Thank You Letters. Above all, you will freely explore your innovativeness, which is crucial for personal and organizational growth. This is associated with the reality that you will not be afraid of messing up! 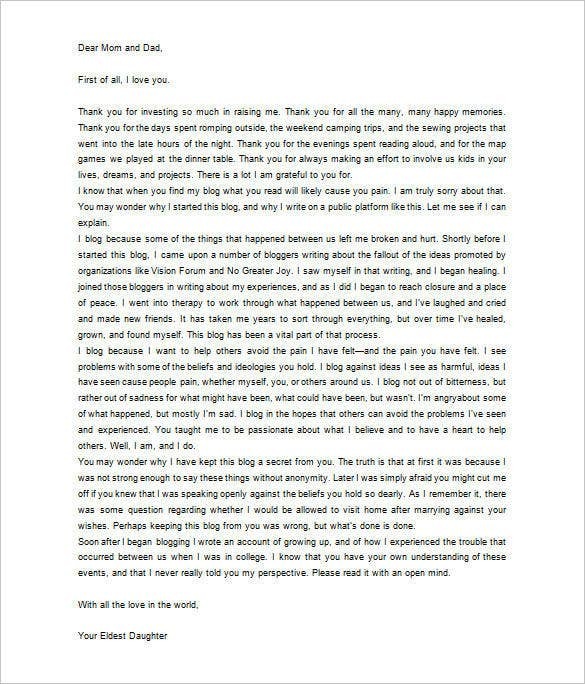 You may also see Thank-You Letter Format. Teachers play a vital role in every child’s life. From the day of teaching alphabets to professional education, every child comes a across a lot of teachers in life. 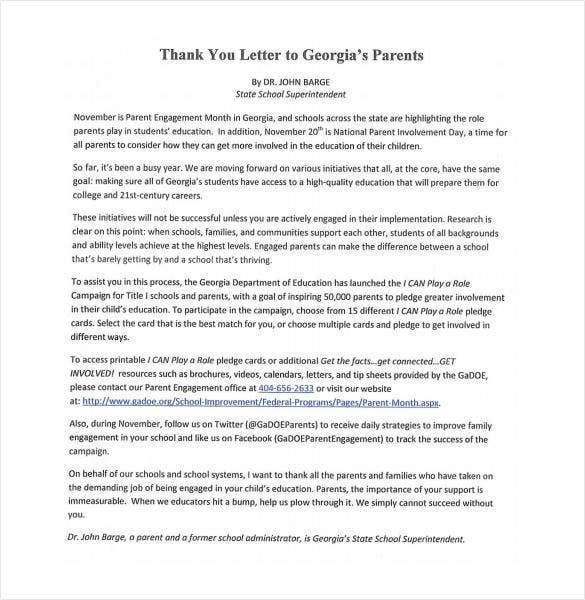 These sample parents thank you templates are best suited for those who want to take a moment in conveying thanks to all those teachers who has made him/her the person he/she is today. By showing this sweet gestures brings a smile of satisfaction in everyone’s face. You may also see Thank-You Letter in Word Templates. These free thank you letter templates with their customizable format will allow you personalize each template so that each and every sample looks different. Examples of various template types are also available to choose from. Download these templates now to express your gratitude and to show that you care. What is Sample Parents Thank You Letter? These letters are a symbol of appreciation to the love and scarification of parents they have been gone through to raise their kids. Every parent dreams their child to be far more successful than they would ever have been. Seeing the success of their child’s future is the only desire most parents wish for. Hence, such letters are designed for giving them thanks for all they have done to raise us. You may also see Formal Thank You Letters. 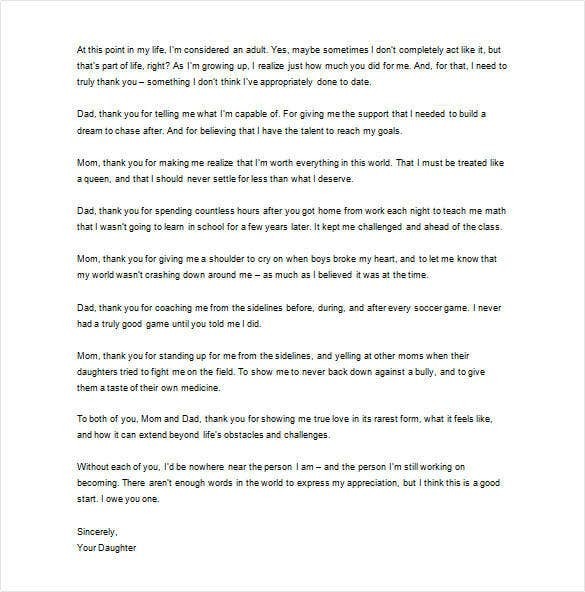 How to Make Sample Parents Thank You Letter? Start the letter by addressing the deep regards and love that you have for them. Count about the tough situations, sacrifices they had gone through to raise you. Show your affection by stating how much they mean to you. Conclude your letter by showing their importance in your life. Such letters are designed to show your affection towards your parents. A small thank you to all the compromises they did with their life to fulfill our wishes and giving us a comfortable life. And hence thanking them for all the love, affection and care that they have showered over all these years. You may also see Thank You Letter for Your Service. These suitable templates are designed for conveying regards to our parents for all the sacrifices they did to raise us and make us a better person in life. Such beautifully crafted templates assure a touch of softness in the approach along with message we want to convey. 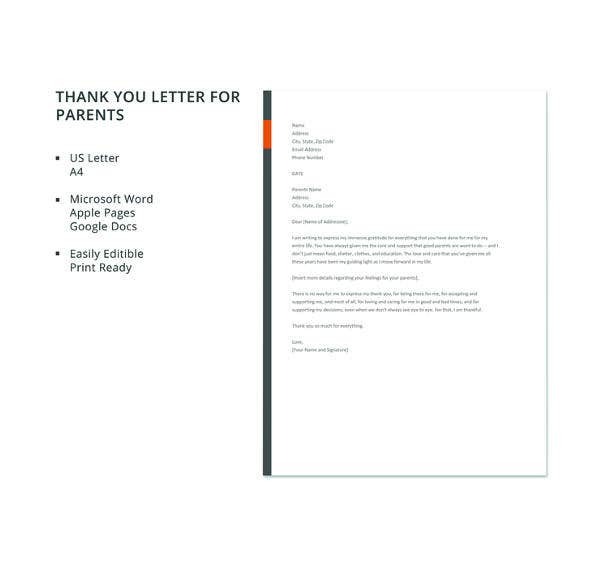 You may also see Parent Letter Templates.